MAREEL has seen some fantastic concerts over the years; but the bar was raised on Wednesday Night with Chris Stout and Catriona MacKay’s Bare Knuckle concert leaving the audience breathless, writes Alex Garrick-Wright. “It’s fine to see some folk here,” Chris laughed, as Catriona gently teased him about his nervousness playing to his home crowd. 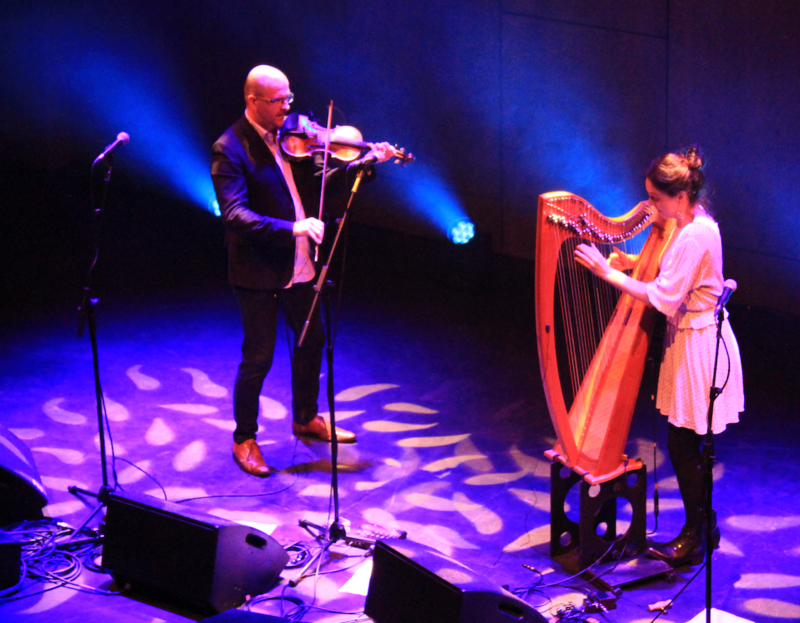 It was the first time the Radio 2 Folk Award-winning pair had stepped on to the Mareel stage in a number of years, and the first time presenting music from their Bare Knuckle album. Any nervousness on the audience’s part was swiftly dispelled with a slow, thoughtful Brazilian number by famed composer Hector Villa-Lobos, Bachianas Brasilieras. Chris and Catriona were, from the first note, entirely and seamlessly in-synch. Chris seemed to make his fiddle weep as Catriona gently underscored with some magical harp-work, before taking the lead and moving into Seeker Reaper from the Bare Knuckle album; a fast and funky piece that exemplified the pair’s own unique style. Punctuated by some charming anecdotes and banter, Catriona and Chris flowed into a really interesting piece called Louise’s Waltz. Each seemed to take turns at leading; Chris’s fiery, passionate bursts of frantic fiddle countered by Catriona’s chilled and sublime harp, a musical ying and yang that stunned the audience. As a showcase of their individual and collaborative talents, this was something special. The album’s title track, Bare Knuckle, was up next, described by Catriona as ‘a competitive little number’. Chris and Catriona began aggressively pizzicatoing at each other, seemingly firing the notes from their instruments towards one another, before bursting into a musical whirlwind of blistering fiddle and divine harp. For Chris’ part, this was some of the best fiddle playing that many will ever get to see. Stealthy Schooner was dedicated to the people of Fair Isle following the recent tragic fire at the Bird Observatory. A piece about ‘nothing in particular’, Stealthy Schooner was a wistful, thoughtful number, with little explosions of passion and some remarkable flourishes from both Chris and especially Catriona, before fading sadly away into nothingness. The first half concluded with some excellent, heart-felt pieces (and a good story about how Chris left a number of Japanese businessmen with a slightly unfortunate impression of his uncle). By the end of the first half, Chris’ bow was in tatters. The second half was a real treat, with local singer-songwriter Arthur Nicolson appearing as special guest. Rather than Arthur merely accompanying Chris and Catriona, it was the other way around. Arthur took centre stage, with Chris and Catriona backing him up on a number of his own works, which he described as a ‘real privilege’. Part of the Frame was a real highlight, with fiddle and harp elevating an already great song to new heights. Catriona’s lively harp provided an extra bit of spark, a new dimension that changed the song to something marvellous. The three played with a wonderful, organic freedom which belied the fact they’d only played as a trio the previous night in Sandwick. That Arthur, Catriona and Chris could play together so effortlessly, with such limited time to adjust to each other, merely laid out how astonishing a musician each of them truly is. Watching them play the exceptional Between the Eyes was like seeing a perfect alignment; a musical syzygy that will linger in the memory for a long time to come. After Arthur’s set came the last track; the exhilarating Moscow Rush, inspired by Catriona and Chris’ adventures in that ‘pretty mental’ city playing with the Russian Philharmonic Orchestra. Apparently saving the best for last, Moscow Rush was a wild and simmering eruption of music, as exciting and heart-pounding as the trip in a Russian gangster’s limo that inspired it. Horsehairs flew off the end of Chris’s bow and Catriona played her fingers to the bone in a frantic and explosive climax that left the audience absolutely gasping for more. Arthur returned for a chilled out encore to cool the audience off before leaving them stunned and satisfied. Why a gig of this calibre wasn’t standing room only is a mystery for the ages. Chris and Catriona take a fiddle, and a harp, and create something far beyond the sum of its parts; music that’s spell-binding, toe-tapping, and mind-blowing. Adding Arthur into the mix was a masterstroke, that perfect ingredient that took the concert from greatness to brilliance. A truly unforgettable experience.